Um.. hello, my baby is eight months old. What? I changed the set-up of the monthly pictures of Sadee because I feel like she is learning so much more than I can fit in a tiny rectangle. - Learned to wave "hi" and "bye"
- Loves music! She will clap and wave her arm every time a song comes on. - Starting to figure out crawling. Mostly it ends up with a grumpy baby on her tummy. - Reaches for the hands of someone close by, in hopes they will walk her around. - Loves to walk, with help of course. - Loves eating, but prefers "grown up" food. Has had a hard time eating baby food lately. - Favorite thing to eat is ritz crackers. - Still sits with her ankles crossed, like she always has. - Weighs 20 lbs. and is 25 ins. long. - Has developed a little temper. Likes to yell when she is mad and throw things. - Has terrible sleeping habits, but hopefully with recently introduced "sleep training" that will end. - Loves to play with electronics and her maracas. - Learned how to flip through books and will sit quietly and turn the pages. - Celebrated her first Christmas, New Year's, and BYU tennis match. - Loves to ride in her stroller and wiggles her feet up and down the whole time. 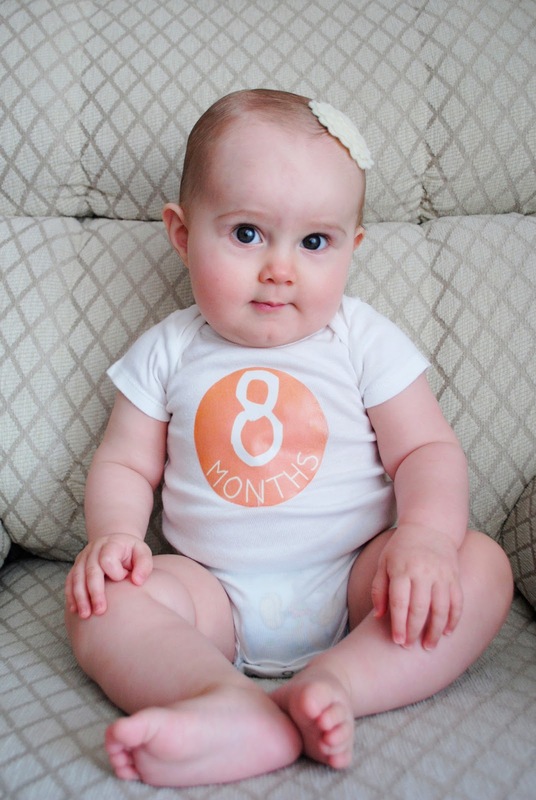 Happy eight months, little baby! Oh.my.goodness. She is so adorable. I love all of her rolls. I love her month to month onesies. Do you make those? Thank you! I did make the onsies. I just designed the circle and printed it on iron on paper.